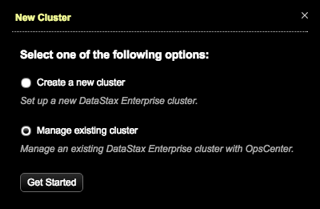 Add an existing DataStax Enterprise cluster to manage within OpsCenter. After you add the cluster to OpsCenter, you can import the cluster into Lifecycle Manager to centrally manage the cluster topology and configuration. Note: If configuration encryption is active, OpsCenter automatically encrypts the sensitive fields such as passwords and writes the encrypted values to the configuration files. Do not enter manually encrypted values in the password fields. Click New Cluster from the OpsCenter Monitoring main menu. The New Cluster prompt appears. Click Manage Existing Cluster > Get Started. Enter at least one hostname or IP address for a node in the cluster. 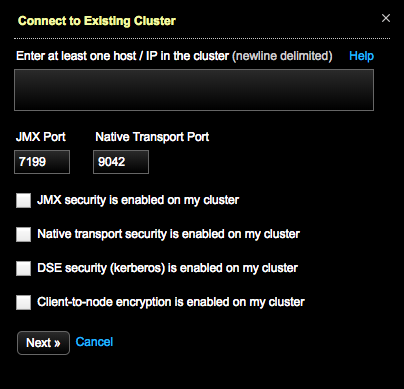 If applicable, change the JMX Port and Native Transport Port listen port numbers if you are not using the defaults. If applicable, click Add credentials to add or edit the user credentials (username and passwords) if the JMX or Native Transport ports require authentication. 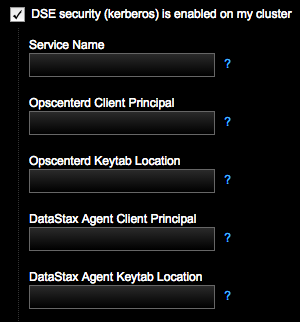 Optional: If applicable to your environment, select DSE security (kerberos) is enabled on my cluster and complete the fields. Enter the Service Name. For example, if the server principal on your nodes is dse/nodeX.your_domain.com@your_domain.com, this field should be dse. Enter the Opscenterd Client Principal for the OpsCenter process/machine to use. The service principal name for OpsCenter is opscenterd/opscenter_node_fqdn, where fqdn is the Fully Qualified Domain Name. Example: opscenterd/opscenterd.your_domain.com. Enter the location of the keytab OpsCenter machine in Opscenterd Keytab Location, which contains credentials for the opscenter_client_principal. Example: /etc/opscenter/secuirty/krb5_opsc.keytab. Enter the client principal for the DataStax Agent process/machine to use in DataStax Agent Client Principal. The service principal name for the datastax-agent node is dxagent/datastax-agent_node_fqdn, where fqdn is the Fully Qualified Domain Name. Example: dxagent/_HOST. Enter the location of the keytab on the DataStax Agent machines in DataStax Agent Keytab Location, which contains credentials for the agent_client_principal. Example: /var/lib/datastax-agent/krb5_agent.keytab. For more information, see Setting up Kerberos and the Kerberos tutorial. 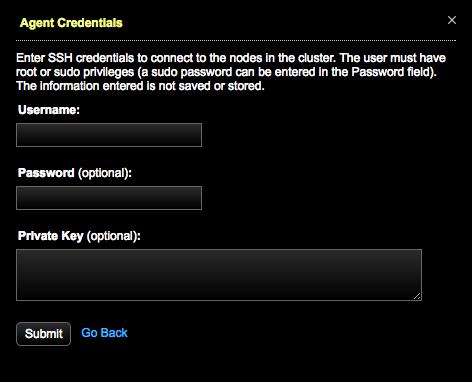 Optional: If applicable to your environment, select Client-to-node encryption is enabled on my cluster. Note: For information about creating keystores and truststores, see Enabling client-to-node encryption in OpsCenter. If configuring client-to-node settings, indicate the following for OpsCenter and each agent to use for connecting directly to the monitored DSE cluster. When client-to-node encryption is enabled for a cluster using Lifecycle Manager, the ssl_truststore and ssl_truststore_password fields are automatically propagated in cluster_name.conf with the corresponding values from ssl_keystore and ssl_keystore_password for both opscenterd and the DataStax Agent. LCM propagates the ssl_keystore value into ssl_keystore and ssl_truststore, and the ssl_keystore_password value into ssl_keystore_password and ssl_truststore_password. Enter the OpsCenter Keystore Path, which is the SSL keystore location for OpsCenter (opscenterd) to use for connecting to the monitored DSE cluster. The value entered in the UI populates the [cassandra] ssl_keystore property in the OpsCenter cluster configuration file (cluster_name.conf). Enter the Password for the OpsCenter Keystore Path. The value entered in the UI populates the [cassandra] ssl_keystore_password property in cluster_name.conf. Enter the OpsCenter Truststore Path, which is the SSL truststore location for OpsCenter (opscenterd) to use for connecting to the monitored DSE cluster. This value should be the same as OpsCenter Keystore Path if the same file is used as both the keystore and the truststore (that is, there is not a separate truststore). The value entered in the UI populates the [cassandra] ssl_truststore property in cluster_name.conf. Enter the Password for the OpsCenter Truststore Path. This value should be the same as password for the OpsCenter Keystore Path if the same file is used as both the keystore and the truststore (that is, there is not a separate truststore). The value entered in the UI populates the [cassandra] ssl_truststore_password property in cluster_name.conf. Enter the Agent Keystore Path, which is the SSL keystore location for each agent to use for connecting to the monitored DSE cluster. The value entered in the UI populates the [agents] ssl_keystore property in cluster_name.conf. Enter the Password for the Agent Keystore Path. The value entered in the UI populates the [agents] ssl_keystore_password property in cluster_name.conf. Enter the Agent Truststore Path, which is the SSL truststore location for each agent to use for connecting to the monitored DSE cluster. This value should be the same as password for the Agent Keystore Path if the same file is used as both the keystore and the truststore (that is, there is not a separate truststore).The value entered in the UI populates the [agents] ssl_truststore property in (cluster_name.conf). Enter the Password for the Agent Truststore Path. This value should be the same as password for the Agent Keystore Path if the same file is used as both the keystore and the truststore (that is, there is not a separate truststore). The value entered in the UI populates the [agents] ssl_truststore_password property in cluster_name.conf. If your environment requires manual installation of DataStax Agents, click Install agents manually. Click the link to access the instructions for manually installing Agents. The Agents Credentials dialog appears. Entered credentials information is not saved or stored. The Agents tab opens, starts installing the DataStax Agents, and displays the progress of the agent installation. The DataStax Agent services may go up and down during the installation process. When the install process successfully completes, the DataStax Agents have been deployed and configured for each managed node in the DataStax Enterprise cluster.